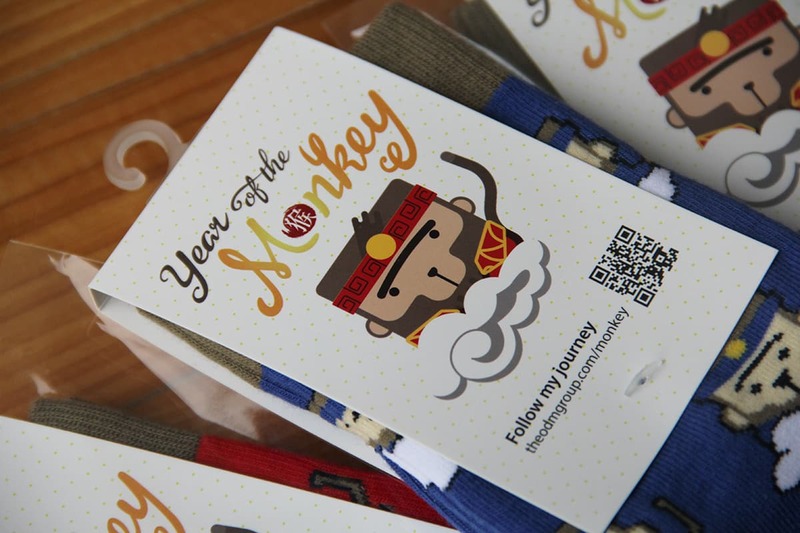 Our lucky monkey socks are in mass production now that sampling process is complete. 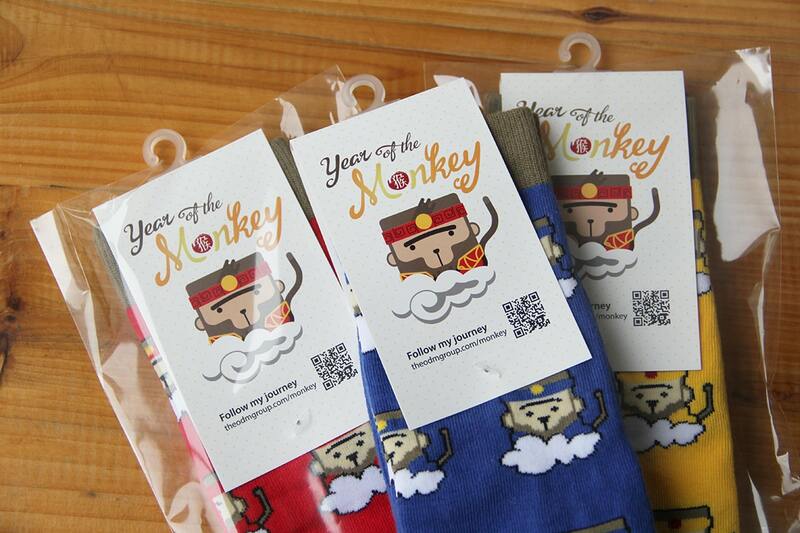 Here is how we started to design the sock packaging and tags. Here is a brief blog explaining the stages, starting with our rational behind packaging decision. Socks can be packaged in many different ways; cardboard boxes, plastic containers and craft tubes to name a few. 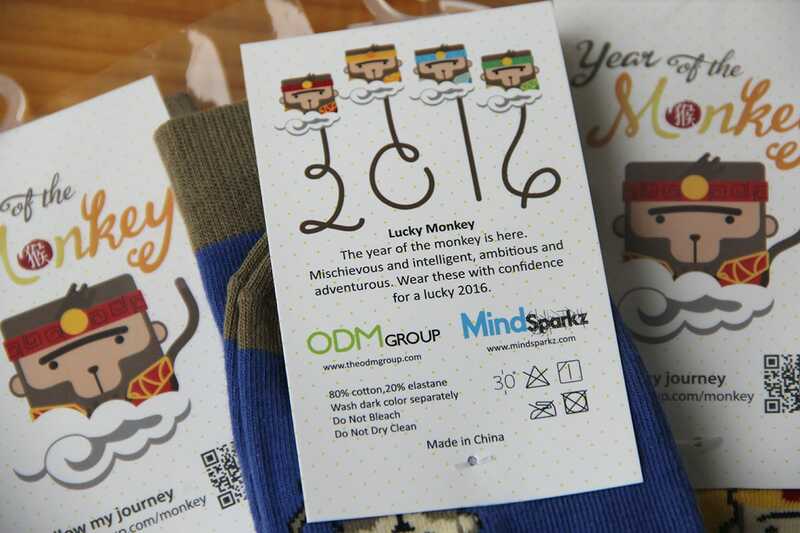 The purpose of our lucky monkey socks is to hand out in meetings and at the up-coming SMMEX trade show in London, England. When shipping overseas and distributing personally, packaging is essential to keep the socks clean and fresh. With this in mind, we decided to use this open-top plastic polybag to carry our socks. Why did we decide on open-top plastic packaging? Freight costs. The cost for shipping individually packaged socks in cardboard boxes is higher. Practicality. This type of packaging is the best option for carrying to meetings. This gift has a high utility factor. Full View. We wanted our design to be on full view and not be hidden in a cardboard box- let our socks do the talking. Interchangeable. Same packaging works for 3 different colour options. Similar to the packaging there are many different styles of sock tags; stick-ons, sliders and foldable cards are three popular options. With the support of our sock factory and our numerous sock case studies we decided to use a thin layer of laminated card attached with a useful hanger to tag our socks. Why this type of sock tag? High Quality. Laminated card is a brilliant material for printing and gets our message accross. Protection. Longer paper tags provide greater coverage and more protection. Hanging Display. Using a plastic hanger means that we can place our socks on show in trade fairs with ease. Mirroring our early development stage, members of our merchandising, sales and design team then got together in order to come up with some ideas for our sock tag. A way to follow the journey. Material formula and washing instructions. The next step was solely in the hands of our design team. They used their creative minds and digital sketchpads in order to create our first design. We actively discuss the practicalities of our designs and concepts. This first design faced three key issues. Too Cluttered. We wanted to make sure our tag was bold and clear. This design was considerably smaller and way too busy than we what we wanted on our sock tag. Text heavy. Words can be overwhelming especially on a product tag. This was another point of action, punchier and snappy sentences needed. Limited our Monkeys. Who knows how many colours of monkeys we are going to bring out in the future? We didn’t want our packaging to limit what we do next. This led to our refined design and the one you will find attached to your lucky monkey socks. Our next monkey blog will be about the manufacturing process of our lucky monkey tag. Be sure to keep an eye on our twitter and Facebook to be the first to find out when it is posted.